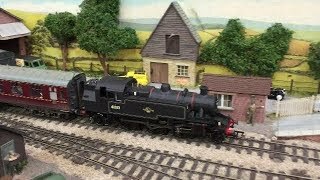 Garrett Lane – OO Gauge – A member layout from Loddon Vale MRC This layout is set in Southern England with 3rd rail electric units operating into a terminus station. It took Andrew several weeks to fit the 3rd rail onto the track. There is also a military base that receives a constant supply of trains including “warwells” transporting various army vehicles. It is a DCC layout and the majority of diesel locomotives are fitted with sound chips. It measures 12ft by 2ft. and is a fiddle yard to terminus configuration. Moretonhampstead WR – 1954 – 1959 – OO Gauge – A British Railways Western Region branch terminus station with goods yard. Brynllwyd – On30. This is an impression of Welsh Narrow Gauge Railways situated somewhere in Wales.